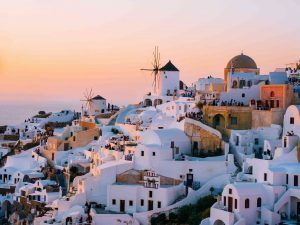 Book your trip to Greece with AESU! Summertime is here, and love is in the air. Some European cities are already popular romantic hubs, but the continent is filled with endless beauty and charm. Discover five of our top picks for 2018! If a bouquet of flowers is a symbol of romance, Amsterdam will top the cake. The Netherlands produces over 70 percent of the world’s commercial flower output, and its capital is filled with colorful varieties. With romantic restaurants, boutique hotels, and picturesque canals, Amsterdam is quickly becoming one the world’s most charming cities. The capital of Iceland is indescribably beautiful, and there is plenty to do for two young adventurers in love. Spend the morning exploring The Golden Circle, pose in front of the waterfall Gullfoss, then relax in the therapeutic waters of the Blue Lagoon. It’s no wonder that wanderlust couples are traveling to Reykjavik by the thousands! If you’re looking for the perfect couple photograph this summer, fly to Greece. The sunsets of Santorini transform the Cycladic island houses into stunning shades of pink and orange. Take a diving lesson, hike from Fira to Oia, and enjoy a traditional gyro on the beach. Filled with elegant parks, charming eateries, and Instagram-worthy landmarks, Porto is the best city for the hopeless romantic. Slow down, relax, and spend the day exploring the street corners and lovely beaches. Treat your sweetheart to a wine tasting with a view, complete with roof terrace and traditional live music. Whether you’re celebrating an anniversary or in search of a summer fling, Berlin is the perfect place. Tour the capital of Germany on a tandem bike, catch a free concert in the park, then enjoy a few cocktails at one of the city’s hot spots. The nightlife in Berlin is especially fun for young couples who want to dance their way through the evening. This entry was posted on Wednesday, June 13th, 2018	at 11:46 am	. You can follow any responses to this entry through the RSS 2.0	feed. You can leave a response, or trackback from your own site.